It’s a rarity in the car business for a daring design to work out, and win favour among buyers. The sport compact segment is one of few where a whacky-looking car will succeed, and that’s why the Hyundai Veloster just… works. Read my review at TractionLife.com. 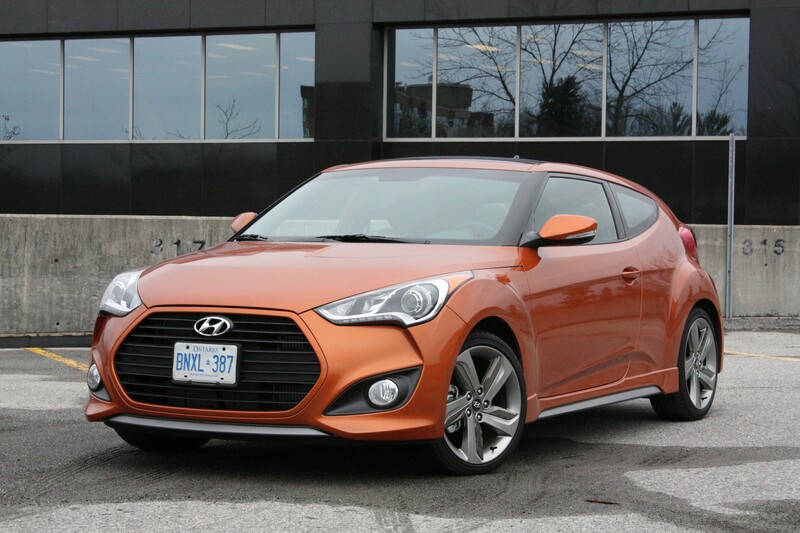 The car is the Hyundai Veloster, and the colour is called Vitamin C. Loud colours work best on cars that look loud no matter what shade they’re painted. Four years since its introduction, the Veloster remains controversial, and that’s just how it should be. 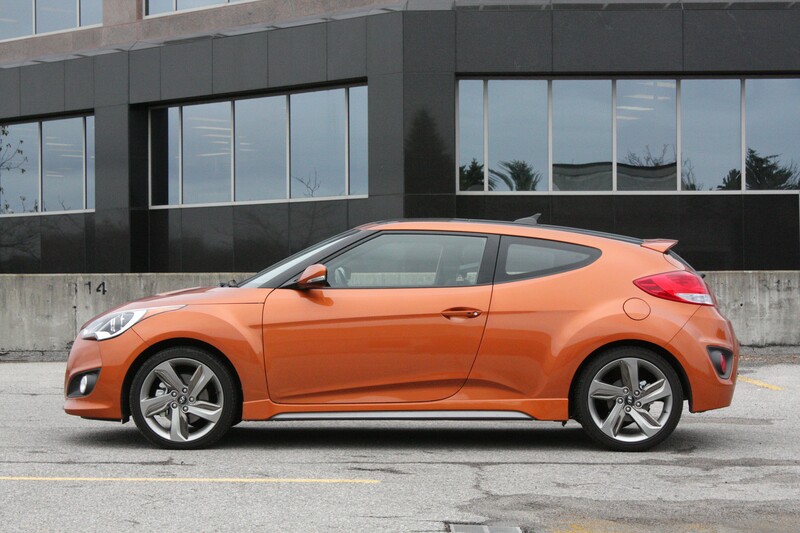 Hyundai calls the Veloster a coupe, but technically it’s not, if your definition means only two doors. 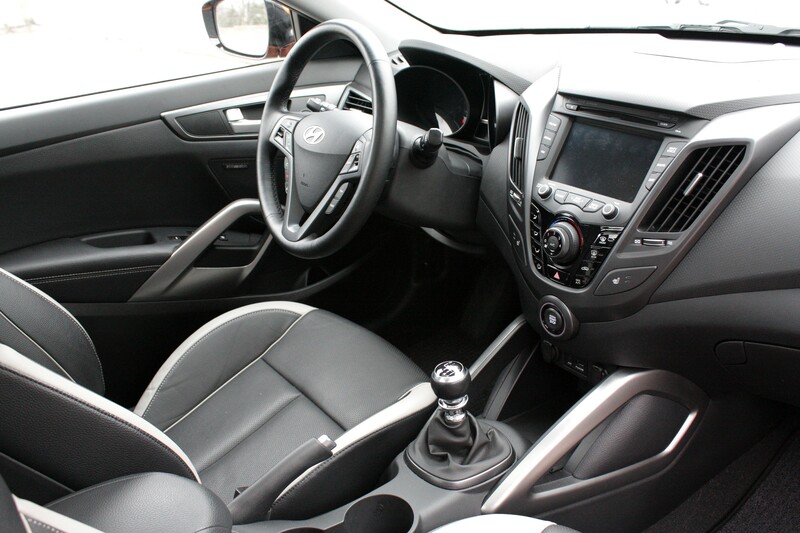 The Veloster has three: from the passenger side, it looks like a weird four-door hatchback, while the driver’s side paints the car as the rakish coupe it purports to be. Believe it or not, the Veloster is based on Hyundai’s Accent subcompact; its wacky styling is the most notable part of the transformation into a wannabe sports car. There’s a ton of glass out back, but little rearward visibility. When reversing, the best view of what’s behind you is through the standard backup camera. 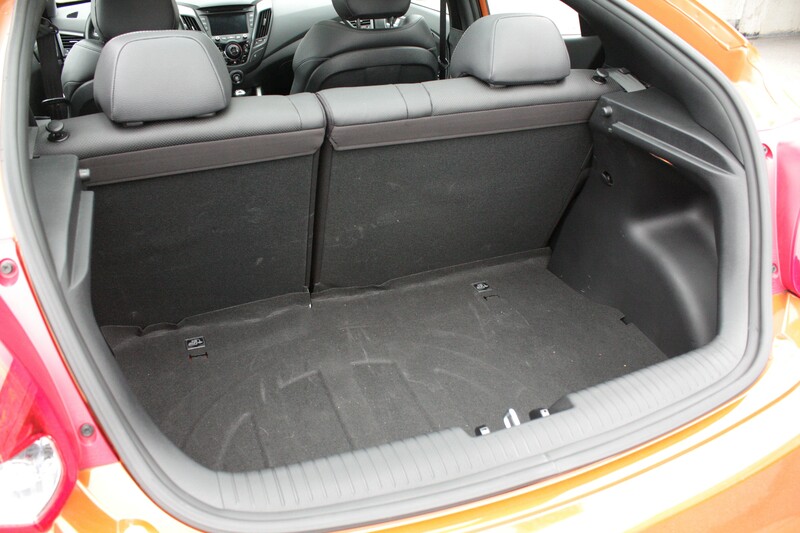 Beneath that big hatch lies (unsurprisingly) a big trunk, and the rear seat won’t make your friends curse you out for making them ride back there. On the downside, your friends will keep asking you for rides. The Odds song “Someone Who’s Cool” (quoted above) is about trying to look cool even when you’re not. That’s you if you buy the lukewarm base model. 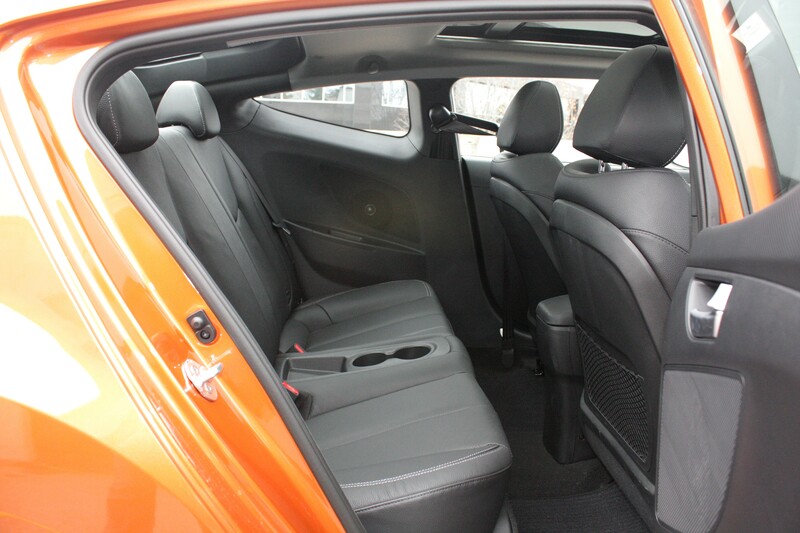 The car I drove had the optional turbocharged engine, which brightened performance significantly, but not quite enough to match the promise of that orange paint: the Veloster isn’t as sharp to drive as the Mini Cooper S, Honda Civic Si or Ford Fiesta ST. Check out the grab handles on the centre console – great to give the passenger something to hold onto when the yahoo behind the wheel gets heavy with the right foot. Similarly-styled door pulls look good, but are also easy to reach when it’s time to close the cabin door and prepare for takeoff. 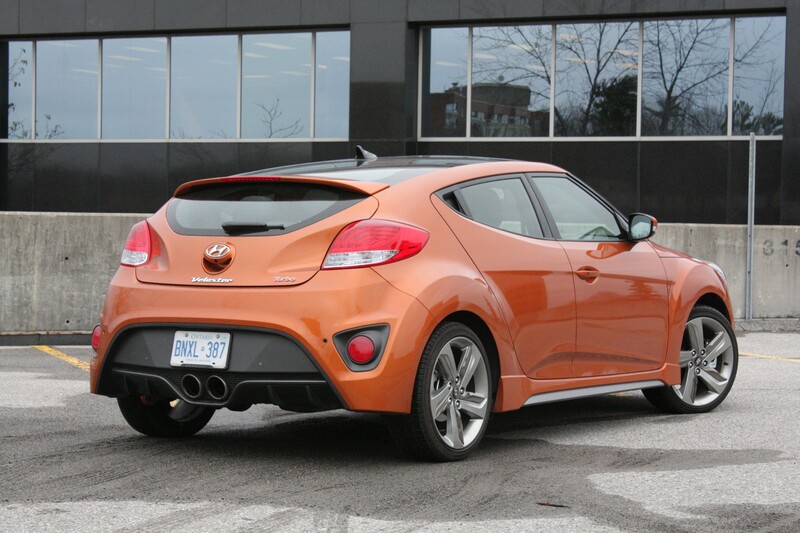 It’s not as much fun to drive as some competitors, but the Veloster Turbo is a great value. A similarly-equipped Cooper S costs thousands more, the Civic Si is dowdy in comparison, and the Fiesta ST rides hard and has sport seats that are uncomfortable in daily use. 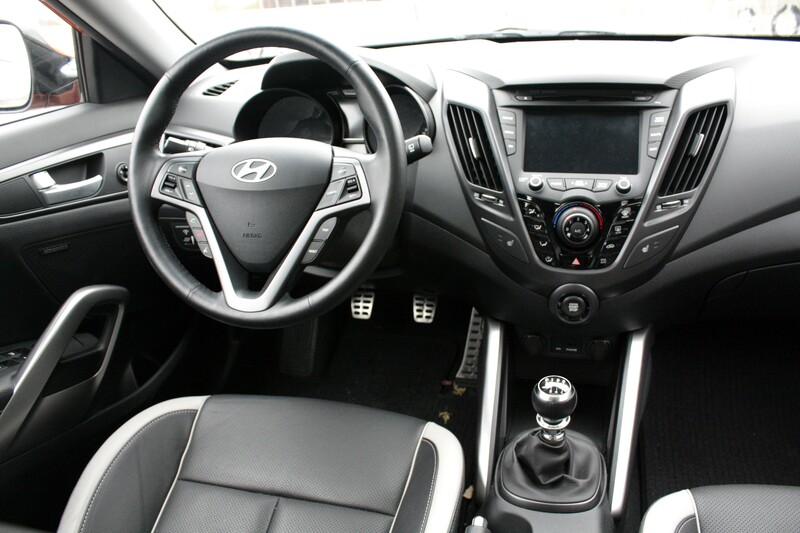 The Veloster combines standout looks with a useful interior and a dash of fun – a combo that’s hard to resist.